In which industries are workers the most and least concerned about AI’s impact on their job security? Or just how interesting it will make their job? 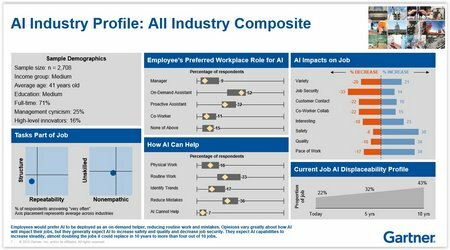 Across industries, what percentage of their work do employees feel AI could do today and in the next 5 and 10 years? How do workers describe their daily jobs in terms of dimensions like empathy required, specialized skills, structure, and repeatability that influence how AI or automation could be used? Looking for some answers on how AI best fits the work (and workers) in your industry? Then you’ll want to check out Gartner’s new document “Survey Analysis: How AI Will Impact Industries From the Workers’ Perspective“. It contains one page profiles of 11 industries with a quick view of key stats curated from a larger survey we did of workers in the US and UK. Yes, this is based on what the workers say, not the owners of AI technology or CIOs or business folk. We have that data as well, but this research fills a gap in understanding what the workers themselves say about the nature of their jobs and thoughts about AI. I described why in my previous posting “Who Will Be a Better Predictor of AI Adoption: Management or Workers?”. What we found is that employees would, by far, prefer AI to be deployed as an on-demand helper — like their own employee — rather than as their manager, co-worker or proactive assistant. In this role, the AI would help by reducing routine work and mistakes. There is a significant amount of variance in opinions about how AI will impact jobs. Safety and quality were areas where there was more consensus that AI could help. But contact — both with customers and co-workers — and especially job security returned mostly negative views. Current jobs, at least from the workers’ vantage point, are fairly low in structure and repeatability, implying that while certain tasks could be done by AI, they are not candidates for full replacement. Their assessment of the special skills and empathy required for their jobs — tasks that AI currently struggles with — also points to a continued role for their current positions. This report is not a distillation of our experts’ views on how AI is predicted to impact each industry. To get the trends and drivers behind this data we have an entire industry team ready to help. My task with this research was to simply report on what the workers we surveyed from each industry said about the nature of their jobs (related to how easy it would be to automate), where they think AI could help or hurt them, and their impressions of AI. Overall, workers expected the pace of improvement in AI to increase steadily, almost doubling the number of jobs it could replace in 10 years to over four out of 10 jobs. All the more reason to get ahead of this trend and create structures now that can evaluate what workers and AIRA (AI, robots, automation) can do and how to help them work better together. That togetherness is often called the “centaur” model. You can hear more about how to do this in my webinar on AI and Robots.